Adventures by Disney (ABD) -- an offshoot of the Disney empire -- was founded in 2005 to provide escorted family tours to far-flung corners of the globe. In 2016, the company branched out into river cruising, offering trips on the Danube River; Rhine River and Seine River. The company does a complete charter of several AmaWaterways boats -- AmaLyra, AmaKristina, AmaLea and (in 2019) AmaMora -- on selected sailings throughout the year. The cruises take in eight destinations across five countries: Germany, Austria, France, Slovakia and Hungary. ABD differs from more "traditional" escorted river cruise tours by emphasizing family at all times. Offerings include VIP access to monuments and sites; a Disney "twist" on trips (so expect surprises); two Disney-trained Adventure Guides who bring each destination to life through storytelling specifically aimed at kids; multigenerational family activities that include everyone, right up to grandparents; and nightly activities for children that give adults time off. 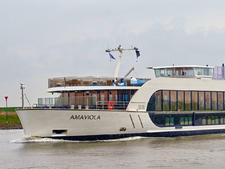 Adventures by Disney charters AmaViola, part of AmaWaterways' European fleet, for sailings along the Danube River. It has a pool with swim-up bar and multiple dining venues. The ships ply the Danube, from Vilshofen in Germany, via Austria and Slovakia, to Budapest, in Hungary; the Rhine, from Basel, Switzerland, to Amsterdam; and France's Seine River, sailing roundtrip from Paris. Christmas Market cruises are also avialable. AmaWaterways is at the upper end of the river cruise market -- though not luxury -- and the ships offer excellent regional cuisine, well-designed cabins, in-cabin multifunction TV/web setups, elevators, a giant chess set -- and even a small swimming pool on the top deck (except for AmaLyra). All ships are nonsmoking (except on the sun deck) and feature a beauty salon, massage therapist and a good-sized gym. Unlimited local wines, as well as beer and sodas, are included with each open-seating lunch and dinner, which consists of regional cuisine with special selections from local European ports. Dining is very kid-centric. Every night at 7:30 p.m., kids -- aka Junior Adventurers -- head to the bar area on the upper deck where they get their own supervised dinner with a special menu of hotdogs, mashed potatoes, spaghetti and plain grilled chicken while the adults dine either in the restaurant or The Chef's Table at the back. Teens eat in the wine rooms, separated from the main dining room. Often the kids' dinner is followed by movie night, timed to end at the same point as the adult dinner (it's a particularly good setup if the adults are eating at The Chef's Table which takes about three hours). Breakfast and lunch are eaten together, but both are buffet-style and informal, which suits younger diners. There is also a kids' menu on offer at lunchtime. When you're on an all-day trip, you can pre-order a kid's meal. The ships are both owned and operated by AmaWaterways, so onboard you'll find a typically diverse set of crew drawn from all over Europe, with the majority hailing from Eastern Europe, and all of whom speak perfect English. Each cruise also features a knowledgeable cruise director who is your go-to for anything ship-related onboard. He'd normally lead tours, too, but Disney brings in its own dedicated Adventure Guides. Daily sightseeing programs are included with each cruise, and tours include wireless audio devices so cruisers don't miss a word on history or culture. On Adventures by Disney river cruises, all excursions are especially designed for families. So beer tasting at a brewery will include a soft drink tasting for the kids and commentaries center on stories rather than lots of facts and figures. At some locales, kids will have their own activities, separate from the adults; at Schonbrunn Palace in Vienna, for example, children headed to the maze while parents took the tour. Another thoughtful piece of programming is that family excursions are usually in the morning, while the exclusively adult ones -- a long bike ride or hike -- are in the afternoons. This is ideal, as it allows a free afternoon of splashing in the pool for the kids while mom or dad (or both if grandparents are onboard) relax or go on the bike ride/hike. All ships offer roughly 20 bicycles that passengers can use to explore ports. There are many activities aimed at children on the ship too, with special Adventures by Disney options for Junior Adventurers that include activity nights, movies, karaoke, relay games, life-size chess lessons, video games and more. Teens will also find activities and themed nights created specifically for them. However, there are plenty of the more traditional river cruise activities on offer for the adults, including wine tasting, music, dancing, an onboard fitness center, superb cuisine and excellent service. Entertainment is focused on local customs and culture, including performances by European dancers or an orchestral group. As you would expect, the passenger mix is almost exclusively families. Kids ages 6 and up are permitted, but it's recommended that children are older than 8, due to the nature of the excursions and activities. There are also multigenerational families, so expect a wide age range -- the upper end of which is more typical of the average Europe river cruise passenger (70+). The passengers hail primarily from North America, as ABD is not on sale in Europe. Adventures by Disney charters several ships, all owned by AmaWaterways: AmaLyra, AmaKristina, AmaLea and (in 2019) AmaMora. The three latter ships, all 170-passenger vessels, have been custom built specifically with families in mind, taking in feedback from Adventures by Disney (while older, AmaLyra is smaller so it can dock in the heart of Paris for Seine River itineraries) New family-friendly design elements include specific room configurations, including six sets of connecting staterooms; as well as some rooms and suites that accommodate three- and four-person families. Shipboard spaces are being created to provide for activities geared toward kids and teens.